We love a good outdoor design trend and the newest craze – vertical gardens – is about as good as it gets. Vertical gardens, also known as green walls or living walls, are wall panels of luscious plants grown vertically using hydroponics. They can be attached to existing walls (like the image below) or can be free-standing structures. Photo credit: snoeziesterre via Flickr. OK, we’ll admit it. Vertical gardens aren’t exactly a modern trend. Yes, the deliberate landscaping of pretty garden walls could be a recent phenomenon. But we’ve been growing creepers up our walls and fences for centuries, living walls are simply taking it to the next level. We’ve all seen them spouting up on the insides and outsides of buildings around our local towns. And we’ve all marvelled at them. But as complex as it looks, it’s pretty easy to get this trend happening in your own backyard (or home interior!). They’re aesthetically beautiful – original works of art! How does it work? That’s what everyone wants to know. Actually, it’s easy. Plants don’t really need soil to grow; they need the nutrients in it. And if there’s another way to give plants nutrients, you can eliminate the need for soil altogether. That’s how vertical gardens work. Photo credit: Fernando Stankuns via Flickr. Pick a space in your backyard (or house) that needs a makeover. It could be your shed’s unsightly corrugated iron wall you want to cover up. Or maybe you want a bit of artistic décor for your verandah. Then again, perhaps you’re more interested in creating a free-standing centrepiece in your garden. Build your frame. Vertical gardens are heavy! So your frame must withstand tremendous weight. Plastic is a good, sturdy choice. And to be on the safe side, check with a structural expert to make sure your chosen wall or structure can handle the load. Attach a plastic sheet to the frame. This prevents water wastage by keeping moisture in the structure. 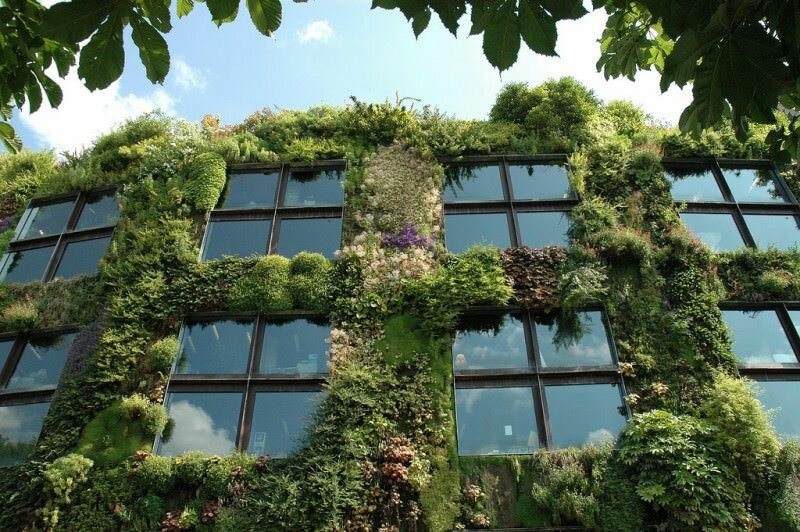 Make sure there is a gap between the frame and the building you want to put your living wall up against so there’s plenty of ventilation for the plants. Pick out and attach a fabric that will be the base for your plants to live in and grow from. Since this is where your plants will source their nutrients, your fabric needs to keep water in well, but be porous enough for the roots to penetrate. Felt is a good pick. Set up an irrigation system that will cover all your plants. A good idea is to attach a pipe or tube across the top of the wall which can drip water from above. Pick your plants! This is the fun part, where you really get to let your creative juices flow. 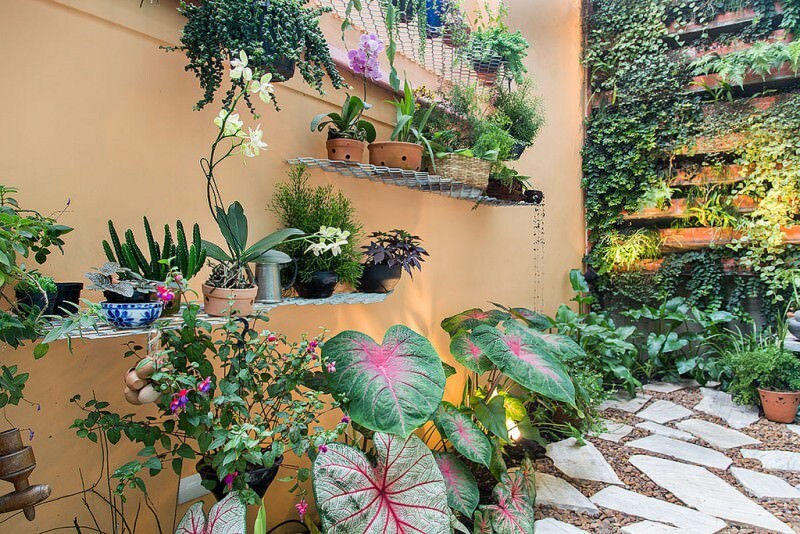 Good green wall plants include geraniums, ferns, begonias, rock lilies, and much more. Check out some more plant choices from this Wall Garden article or our list of Australian Native Plants. Make sure your structure is solid before you plant. If you need to fix it up afterwards, you may damage your plants’ roots or stems. Once the plants are in, keep them watered and fertilised enough. This is especially important if your garden wall is outdoors and exposed to the elements. There are plenty of living wall ideas out there – you need only browse the web to find a wealth of inspiration. 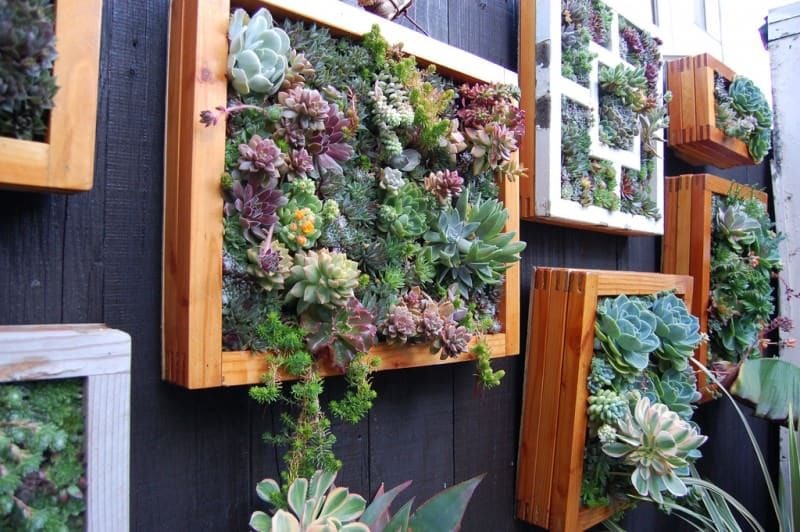 If you’re looking for some DIY vertical wall inspiration, a gutter garden or a succulent vertical garden may be your best choices. Photo credit: FarOutFlora via Flickr. Vertical walls are a pretty swell addition to any backyard (or home interior – or even your office! ), making your outdoor space both original and practical, especially as our Aussie gardens grow smaller by the day. Or explore our range of pergola products.